Pink Sounds Off on New Album "Beautiful Trauma"
Pink has returned to her Beautiful Trauma world tour after a six-year break, with her adorable family in tow. The 39-year-old "What About Us" singer began her concert series a year ago and has been bringing husband Carey Hart and their kids Willow, 7, and Jameson, 2, on the road! Earlier this month, the four joined Pink as she began a new North American leg of her tour. Pink and Carey have posted photos of their children hanging out with them, having fun playing on their own backstage, and watching the singer onstage. She performed at Amalie Arena in Tampa, Florida last weekend. There, she received a "Walk of Fame" star bearing not only her name, but the names of her husband and children. "Brilliant night tonight Tampa," the singer, who last month received a real star on the Hollywood Walk of Fame, wrote on Instagram. "Y'all made my heart happy." See photos of Pink and her family on her tour. "We celebrated our 100th show of the tour tonight in San Antonio with one of the best crowds ever. What a night," Pink captioned this celebratory post. "I'm holding Willows ears so I can say how I really feel about it." "Art night in Shreveport #tourlife #dreamcatchers #travelinfamilyband," the proud mama captioned the snapshot. Carey and Jameson enjoy some quality time backstage. Pink and Willow visited the Oklahoma City Memorial to honor those affected by 1995's Oklahoma City bombing. Pink shared on Instagram, "Truck stops in Texas. Don't ask, just do it." The pop star takes her son to a cemetery in Lafayette. "Shooting the s--t before the first show #thankyoueveryoneforyouramazingenergytonight," Pink wrote on Instagram, alongside this photo of her and kids before taking the stage in Phoenix for her first Beautiful Trauma world tour. Pink's son sits inside a Mitsubishi forklift truck backstage. "Road life parent fail. Hotel room Bmx session," Pink's husband Carey Hart wrote. Pink's son Jameson, 2, wears a pair of Baby Banz noise-cancelling headphones as he and his dad watch the singer perform. Pink's kids Willow, 7, and Jameson, 2, enjoy some time in a rec room. "Thanks Tampa," Pink wrote on Instagram. "Who's ready for the show tonight?!" Pink's son is truly the boss. "Brilliant night tonight Tampa," Pink wrote on Instagram. "Y'all made my heart happy." The family sits down for their biweekly family dinner while on tour. On Thursday, Pink shared on Instagram a photo of the four dining together, writing, "At least twice a week on tour, we shut the door to the outside world and have family dinner. As you can see, it makes Jameson feel deep, deep joy. #lastedsevenminutes #gratitude #space#conversation #loosescrews." Pink then got into a bit of an Instagram spat with a fan after the person wrote, "Except it's posting on ig." "Yes I like to promote healthy stuff," Pink said. "I also like to remind people to stop being TOTAL DOUCHE BAGS TOO. Consider this your reminder, F--ko." "@pink and well damn, I was coming to see ya Sunday night in Nashville...still love the music," the fan replied. 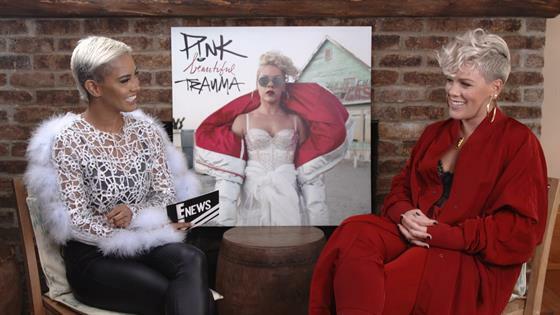 "That doesn't change my answer," Pink said. "That just makes you confused." This article was originally published on Fri, March 8, 2019 at 1:16 p.m.